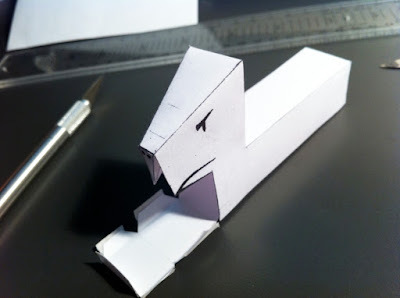 And so begins the "Trial and Error" portion of my paper toy design process. Which is basically: Fix — Print — Construct — Repeat... until it's perfect. At which point, it should start taking shape and look as I intended it. Then, when I'm completely satisfied with the template, comes the really fun part! I finally get to add colour and put on the finishing touches that make it look AWESOME!!! I may only have a munted, disembodied head right now, but as I mentioned earlier, there's still a lot to do before it actually starts looking like something. So check back every now and then, to see how it's going!